Finally, thanks to Another World's beta testing, I have finished Jewel Warehouse. 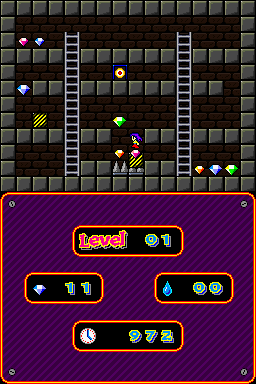 The object of the game is to collect 20 jewels on each level, and head to the exit. There are various traps, obstacles and puzzles to get around in order to do so. Use the D-Pad to move. You cannot jump, hold down the direction button to float as you fall. A is the action button. This controls switches and shoots water balls when able to. Yellow Crates: You can push these onto spikes to make a path to the exit. Be careful of pushing them into fires, force fields, and make sure acid does not drop onto a crate, this will destroy them. However, sometimes destroying a crate is necessary to solve a level. They will move on conveyor belts. Water Drop: Collect these to get 5 Water Shots. Water Shots extinguish fires. Guardians: These patrol either left/right (Ship) or up/down (Bubble). Switch: These control force fields and conveyor belt directions. Spikes / Fires / Acid will kill you on contact. As will Guardians. If a crate pushes you into a wall, it will squash you to death. Known issues: if it crashes after you have completed a level, you will need to power cycle your DS. However it should save your progress. This bug is out of my control unfortunately. Also, the start button can be unresponsive occasionally. If this proves to be too much of an issue then you can close the DS lid to pause the game. Jewel Warehouse FULL (FINAL) NEWEST!